This weekend is ThanksGiving weekend in Canada and with it, tons of families will be reunited and stay over each others’ house. To celebrate ThanksGiving and make sure your guests enjoy their stay, we compiled our 5 favorite & affordable guest room essentials. 1. 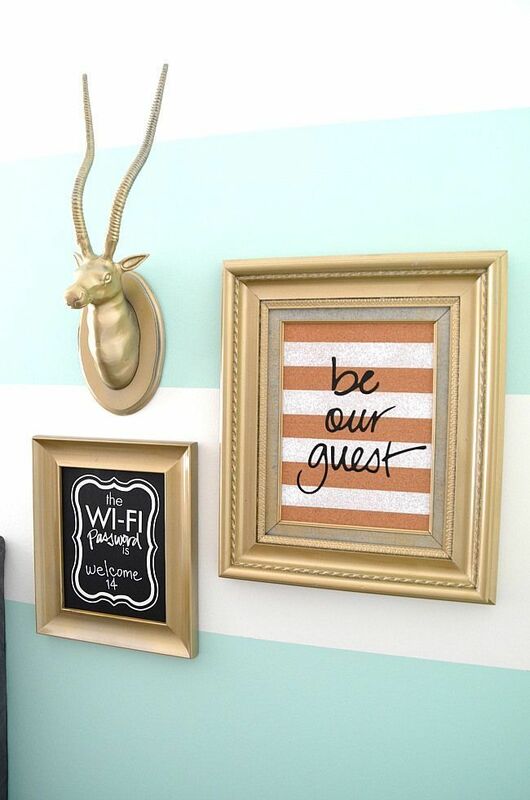 Provide your wifi password in a cute and decorative frame so they don’t even have to ask. Plus, if you’re like us, you probably never remember what it is anyway! 2. Sample size products in a jar… because they will most likely forget their toothpaste or shampoo and it’s the perfect way to finally use all these free samples you have! 3. Fresh water with a glass, reading material and even flowers are all very nice additions to your guest room that will make them feel welcome. 4. Snacks and treats in case they’re up late or early…and starving. 5. Extra pillows, blankets and fluffy bath towels to make sure their stay is as comfy as can be. Happy ThanksGiving to you and your loved ones in Canada!